Eric Weiner, an award-winning foreign correspondent for NPR and a former reporter for the New York Times, has written stories from more than three dozen countries, including Iraq, Afghanistan, and Indonesia. His commentary has appeared in The New Republic, The International Herald Tribune, and The Los Angeles Times, and he writes the popular "How They Do It" column for Slate. He has lived in New Delhi, Jerusalem and Tokyo. "With one single book, Eric Weiner has flushed Bill Bryson down a proverbial toilet, and I say that lovingly. By turns hilarious and profound, this is the kind of book that could change your life. 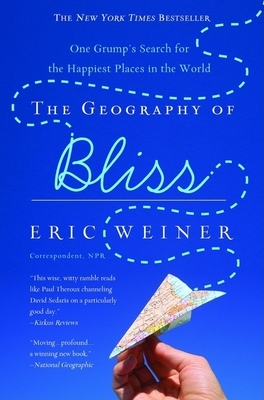 The relationship between place and contentment is an ineffable one, and Weiner cuts through the fog with a big, powerful light. The Geography of Bliss is no smiley-face emoticon, it's a Winslow Homer." "Part travelogue, part personal-discovery memoir and all sustained delight, this wise, witty ramble reads like Paul Theroux channeling David Sedaris on a particularly good day..... Fresh and beguiling." "Laugh. Think. Repeat. Repeatedly. If someone told me this book was this good, I wouldn't have believed them. "—Po Bronson, author of What Should I Do With My Life?